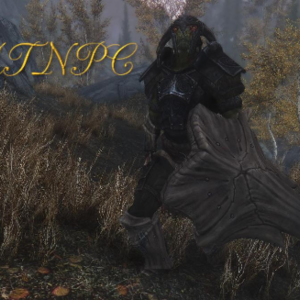 This is a WIP mod that hopes to brighten up the world of Skyrim by adding in more fun and interesting Npcs with their own stories, events, and places. Currently I only need these actors, but that's subject to change easily as I am always thinking up new characters and ideas. Progress has been going fairly well on the mod and it's starting to gain some notoriety I guess, I've been getting some help from some people to help better my skills. This is a new group of NCPs that have been established for the mod. These ncps will be part of a small but fun quest called "Til Death Do Them Part"
Ulrik is a rough-looking male Nord of average age. You do not know much about Ulrik when you meet him. He approaches you in a tavern one night and slips you a note to meet him in a secluded location at a later time. You meet up with him and there he reveals that his ex-wife is spreading nasty lies and rumors about him killing her newest husband. He claims that she's crazy and that she's obviously the one who killed her husband. There's starting to be some heat on Ulrik as suspicion is being thrown his way. He asks you to deal with the issue. He's a rather secretive acting guy who hates his ex-wife and calls her crazy. "You look like someone who's trustworthy and can get a job done. I know it may be a lot to ask of a stranger but I need you to take care of her. I never wanted it to come to this but I can't have that woman spouting these horrible lies!" "The issue here is my former wife, Inga. That woman will be the death of me yet. She's been going around spouting lies and rumors about how I'm the one responsible for her latest husband's death! Now at first it was just another reason to hate her, but now I think the guards are starting to throw suspicion on me!" "Of course I didn't do it! That woman is mad I tell you. This isn't the first man she was married to who met a strange death. Oh no. She had another husband before me, fellow went missing one day. Turned up next Morndas, nothing left but a bloody carcass. She told the guards he must've been attacked by wolves out on the road. Does that not seem suspicious to you?" !Only bairly related to this quest! But a character none the less. Scorn is a gruff and hairy Nord. He is a battle axe enthusiast who's set up in Solitude at the moment. He doesn't show much care for the outside events and shows no emotion to sad mournful events such as a man's death. In fact after seeing a man publically executed he's only interested in one thing, the axe used to cut off the traitor's head. He's a collector of all battle axes. He wants to get his mitts on every axe he considers of value. "Did you see that? Ha ha! Wonderful sight isn't it? Oh when it slammed down the shimmer of light bounced right off like an omen. And that cut, Masteful! Sliced right through the man's neck like butter!" "No my friend I do not consider myself a Lunatic. I am an enthusiast! Do you know how much that axe would go for on the market?! I'd wager nearly three times the default value. The axe that silenced a traitor! Oh just think about it!" "I tried to talk to the headsman after the whole ordeal but oh he wouldn't listen! I told him I'd give him twice what he paid! What fool would pass that deal up?" Inga is a female Nord and is the former wife of Ulrik. She's a deeper voiced female and has a stern tone. She's had three husbands, the first died, the second was Ulrik who she split up with, and the third recently died. She's been going around saying that her former husband Ulrik is the one responsible for her recent husband Jolgar's (Yull-garr) death. She insists that the man has a ridiculous grudge against her for ending their marriage and is trying to get an awful revenge on her. "Ulrik. That man is without a doubt the reason for my husband's death. I'm sure of it. He's had a grudge on me since we split up." "At first he just sent these awful letters. Calling me things like a filthy witch or a harlot. Then he and some of his drunken companions came up here and gutted a pheasant on our lawn. After that Jolgar hired some guards to watch the place." "I honestly think the man wants me dead. I wouldn't be surprised if he's tried to contact the Dark Brotherhood about me. The guards around here told me they'd look into the whole situation. I hope they put him behind bars with all the other dangerous lunatics." Imperial Guard that's looking into the claims of Ulrik being the murderer of Ingun's husband. He has absolutely no idea who's telling the truth, but he's trying to get more info. On one hand he finds Ingun to be a little bit exagerrative, but on the other hand he does find Ulrik to be a strange fellow. He speaks in an official tone, like all the other guards of Skyrim. "One does have to put some suspicion on Inga. Woman's gone through three husband's in just a short time. Two of them ending in death. Just seems too coincidental if you ask me." "Investigating all of this has been tough. Honestly I don't have any clue who's telling the truth here. Both sides of the story here sound fairly reasonable." "Inga gave us a report that Ulrik and his men came up here and cut up a pheasant on their lawn as some sort of scare tactic. We do have accounts that some men were causing trouble up here, but no accounts of Ulrik being with them."